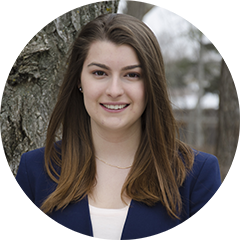 Victoria Gagné, BCom’18, has been interested in business for her entire life. As a child, she went door-to-door in Regina, Sask. and sold eggs from her grandfather’s farm. Now, as a student in the Desautels Faculty of Management, she wants to use what she has learned to change the lives of others. “Everything I’ve been given in life, I want to use to help other people and to give back to my community,” she added. After receiving the Elisabeth H. Stedman Best in the West Entrance Scholarship last year, Victoria wasted no time getting involved on-campus. Being Métis, Victoria decided to serve as a volunteer mentor in a program run by the First People’s House. She also sits on a committee for the Indigenous Studies minor, providing valuable feedback from her perspective as an Indigenous student as the program develops. Partaking in these enriching activities was only possible because of the financial support she received through McGill. “Choosing to move away was a difficult decision, and receiving an entrance scholarship made a huge impact because it gave me that courage to trust that someone believes in me,” she said. It’s also freed up her time so she can pursue her passion for volunteering. If she hadn’t received the scholarship, Victoria would probably be spending more of her time at a part-time job. Instead, she’s able to give her time towards causes she believes in. So far, Victoria has been able to fund her education entirely through scholarships and bursaries, and has mentioned the entrance scholarship on every application. “It really created that domino effect,” she said.